Happy Saturday! It's been a while since I've done a breakfast post soo here's what I had to eat this morning. The pancakes are plain this time around, unlike the banana and raisin number I shared back in March. But shifting the focus away from the pancakes, let's talk seasonal fruits. Where I am at the moment, peaches are in absolute abundance. You can't walk into a store or market without being hit by the smell of sweet, fragrant peaches. Nothing says summer like fresh fruit so I've topped my pancakes with lightly spiced peaches and oodles of freshly squeezed lemon juice. Yum! Mix the flour, baking powder, sugar, melted margarine and almond milk in a large bowl to form a thick, gooey batter. Drop 1 cooking spoon of the batter into the centre a non-stick frying pan and cook/brown on both sides (medium-low heat). Repeat the process for the rest of the pancakes. Place the diced peaches in a bowl and toss with cinnamon and nutmeg until evenly coated. 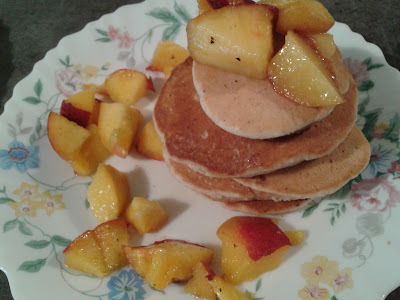 Stack your warm pancakes on a plate and top with the spiced peaches. Squeeze as much lemon juice as you want over the top. I miss eating pancakes and really fresh fruits. I shop try this someday. I tried this today and it was delicious. I didn't use sugar but added a table spoon of agave nectar syrup and drizzle on top as well. I also used spelt flour. Really loving your recipes.